Offshore oil drilling in shallow waters (depths of less than 500 feet) has been in existence since World War II. While oil spills in shallow water have occurred in the past, only 15 barrels of oil have been spilled in over 11,000 shallow water wells drilled in the past 15 years—a remarkable record. 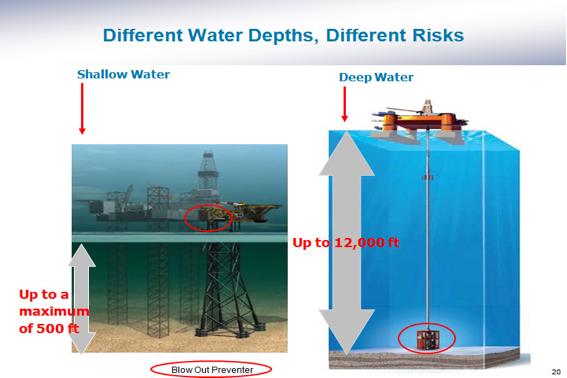 Compared to deepwater oil drilling, shallow water drilling is less complex, resulting in better safety records from a more established industry. So, it is very bewildering that the Obama Administration included shallow water drilling in its initial moratorium on offshore drilling and set up additional rules for drilling in these lower depths. These new rules have consequences. The rules will further increase the costs of drilling in shallow water and they will increase delays in permitting. These changes will result in less domestic oil production, greater oil imports, and higher energy prices for consumers—all for an activity that has spilled 15 barrels of oil over the last 15 years. According to records from the U.S. Bureau of Ocean Energy Management in the U.S. Department of Interior, 11,070 wells were drilled in waters of less than 500 feet in the past 15 years with only 15 barrels of oil spilled. [ii] During those 15 years, the largest spill was 10 barrels, occurring offshore Louisiana on March 8, 2003. In fact, according to the National Academy of Sciences, between 1990 and 1999, oil and gas drilling represented only one percent of all petroleum discharged in North American waters. 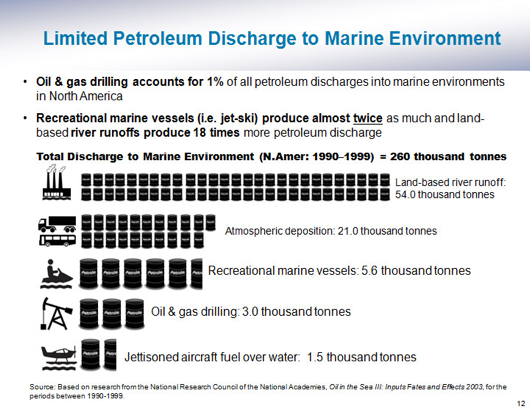 Recreational marine vessels, for example, discharged almost twice as much. See chart below. However, that is not to say that accidents have not happened in shallow water. In 1979, Mexico’s Ixtoc oil well’s blowout in 160 feet of water was the largest oil spill in the Gulf of Mexico until the Deepwater Horizon spill occurred this year. And last year, off the coast of Australia, an oil spill occurred in 250 feet of water caused by an explosion on the rig. [iii] While some had thought oil spilled when a fire resulted from a rig explosion in shallow waters off the Louisiana coast recently, the fire was contained and the 13 crew men were rescued without a spill occurring. 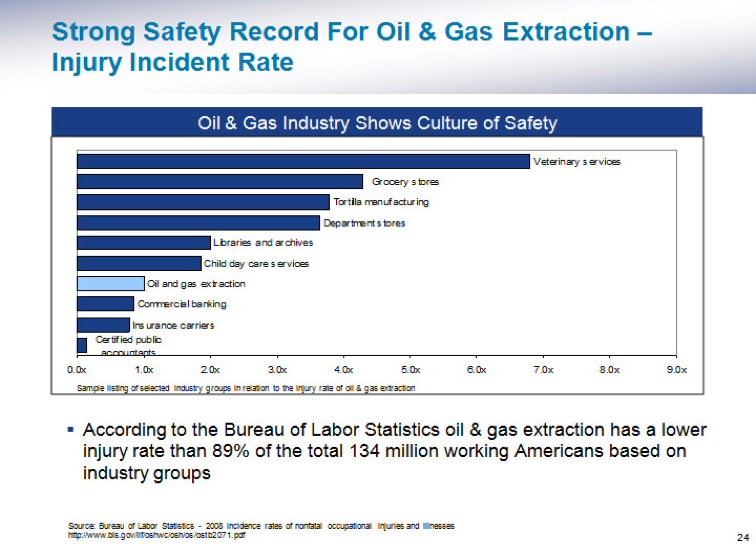 [iv] Using 2008 data, the Bureau of Labor Statistics indicates that oil and natural gas extraction has a lower injury rate than 89 percent of working Americans based on industry groups, with grocery and department stores, for example, having higher incidence rates. See chart below. The Obama Administration decided to include shallow water drilling in their moratorium on offshore drilling in early May, but lifted it quietly by the end of the month. Unfortunately, though the ban on shallow water drilling offshore was lifted on May 28, 2010, just 22 days after it was instituted, a de facto ban continued because of the very slow approval of permits by the Bureau of Ocean Energy Management. In 2007, drilling companies, on average, applied for 20 permits a month; in 2008, they applied for 18 permits a month; but, in 2009, due to lower energy prices, they applied for less than nine a month. As prices increased into 2010, applications were averaging 11 a month in the first four months of 2010. [viii] Once the Deepwater Horizon accident occurred and after the moratorium was pulled on shallow water offshore drilling, shallow water applications slowed due to uncertainty about the rules. 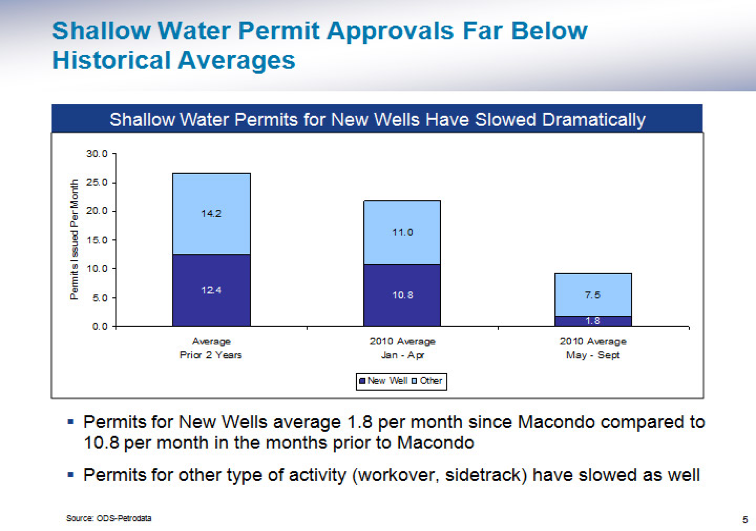 Permits for new shallow water wells averaged just 1.8 a month between May and September, 2010. [ix] See chart below. According to the Administrator of the Energy Information Administration, it could take two years to recover from the moratorium resulting from the Deepwater Horizon spill because of the lag time between drilling and production. [x] The outcome of the moratorium then is lower oil production offshore in the Gulf of Mexico; more oil imports from foreign countries, making the United States more dependent on those countries for oil supplies; higher oil and gasoline prices; and less income for federal, state, and local governments. 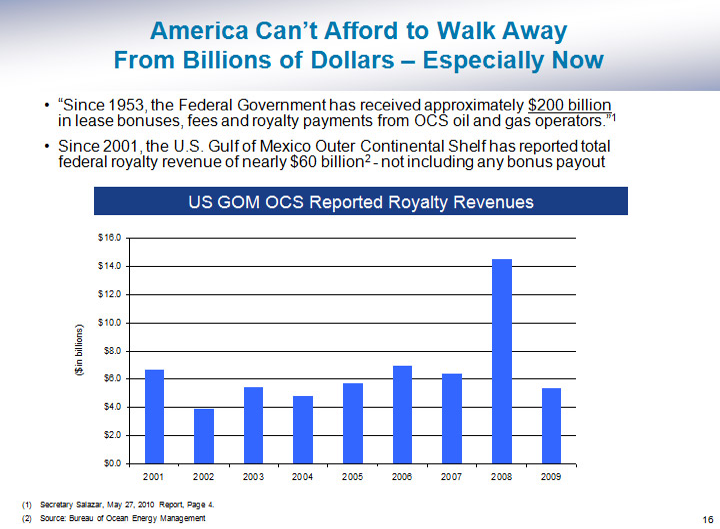 According to Department of Interior data, nearly $60 billion has been collected in federal royalty revenue from offshore activity in the U.S. Gulf of Mexico since 2001[xi]. See chart below. It is unclear why the Obama Administration included shallow water drilling in its initial moratorium on offshore drilling when the mechanics and engineering principles of the industry are so different from deep water drilling and exploration. And, the resulting delays for obtaining permits due to the new rules for shallow water drilling along with the higher costs required to meet those rules are hurting mainly the small independent oil and gas producers, who represent over 70 percent of the shallow water market. According to the Federal Register, the new rules will cost shallow water drillers $90,000 more per well to comply with the regulations. [xii] Some industry representatives are wondering whether the small independent producers can afford the increase. [xiii] Regardless, the delays in permitting and the new rules will mean less domestic oil production, more oil imports, and higher energy prices for consumers.